North End of Kapiti island is a totally different experience than Rangitira. Situated on the northern tip of Kapiti Island the northern end walks follow a gentle gradient through scrub land and regenerating native bush and coastal vistas. 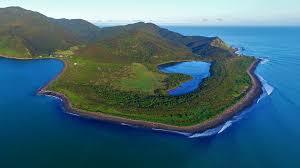 You will still see an array of rare and endangered native birds and experience Kapiti island's unique flora and fauna. More exposed than Rangitira North Endmay be the poor cousin to Rangitira but still stunning. Walking tracks at the northern end of the island pass through grassland,shrub land, regenerating forest and coastline, and provide fantastic views of freshwater Okupe Lagoon. Walk the Okupe valley loop to the western cliffs at 198 meters 1hr 30 return or the Boulder Bank loop track which follows the coastline around the boulder bank, a 2km 45 minute loop track. Unique in its own way the northern tracks are a fantastic to experience to see a different Kapiti island. Because this is not our main track and is more difficult for the skipper to get to a minimum of 10 is required for the sailing to be viable or by negotiation.